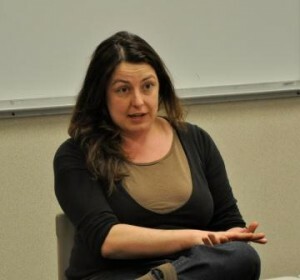 On Tuesday, March 8, 2011, Heather Sandford (CALS ’91) shared the challenges of owning a small scale farm. Heather and her husband Brad (also CALS ’91) own “The Piggery” a company whose product springs from their heritage breed pig farm in Trumansburg, NY. The Piggery model is based on CSA (Community Supported Agriculture) shares, sold both locally and to NYC customers, as well as local sales at the Ithaca Farmer’s Market and The Piggery Deli in Ithaca, NY. The Sandford’s have their hands full with the farm, which currently has about 183 pigs. All heritage breeds, the pigs are pasture fed, supplemented with locally raised small grains and whey and the Sandford’s provide on-site charcuterie, turning just about every bit of the pasture pork into products their customers can use quickly and easily. In addition to their primary role in the daily farm operations and meat processing, Heather and Brad spend a considerable amount of time on marketing, sales, and education. They see it as part of their business to not only provide fabulous charcuterie but to educate their customers with recipes and cooking tips, farm tours, and general information about their operation. While “The Piggery” operations are growing for now, government policies play a large part in the stability and financial success of this type of farm. The breadth and seemingly capricious nature of the USDA processing regulations means small slaughterhouses find it increasingly difficult to maintain their facilities, threatening the smaller area farmers who rely on them. With many regional processors booked two years in advance, the closing of any single processor can be devastating to an individual farm. Both Sandford’s are relatively local (Heather is from Rochester and Brad is from Geneva) and after a number of years in California, they were delighted to find such a strong network of small farms in the Ithaca area. With outlets such as the Ithaca Farmer’s market and their individual CSA’s, this community of producers not only support one another but encourage the growth of the small farm model. The event was sponsored by the SHA/CIA Alliance and the Cornell Dinner Club.